Absolver is a game with a lot of bold ideas. When the stars align and these different ideas come together well, it’s a captivating experience and one I could see myself losing many hours in. 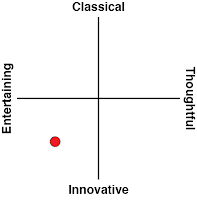 Sadly, it’s unusual that the game actually hits that sweet spot; as often as not, odd design decisions and technical frustrations get in the way and turn a potentially great game into a tiresome one. 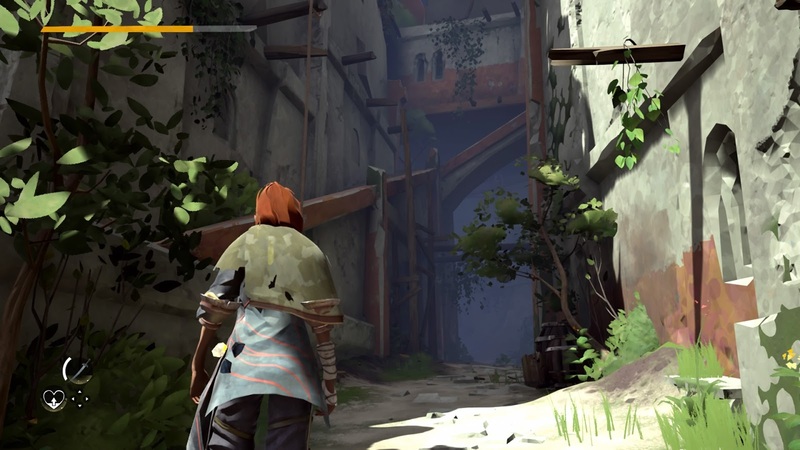 Absolver casts you as a Prospect, a mask-wearing monk on a journey of martial arts training and personal growth through the ruins of the fallen Adal Empire. After a deliberately vague introduction shows your Prospect being selected from a group of hopefuls, you’re transported to a world of crumbling buildings in the midst of being reclaimed by nature. 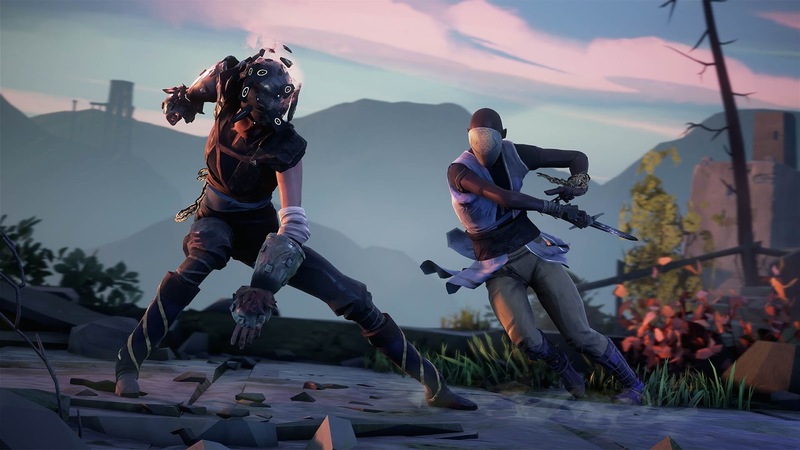 The mysterious “Guides” task you with finding and defeating six powerful foes, so that you might become an Absolver – though what an Absolver is and why you’d want to be one remains a mystery. With this setup, you’re left to wander the Adal ruins, fending off assailants and getting stronger. 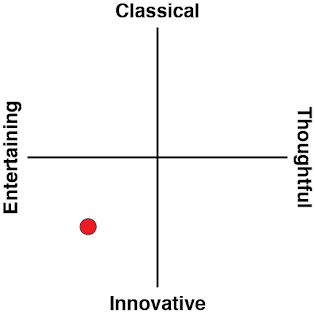 The martial arts premise gives way to an exciting combat system that prioritises patience, timing, and awareness. Depending on which of three fighting styles you choose when creating your character, you can either parry, absorb, or evade incoming attacks. This is the key to victory. Not only does it protect you from damage and open the window to a counterattack, well-timed defensive moves also restore precious Stamina, which is vital to mounting a strong offence. There’s also a more standard guard that isn’t timing-dependent, each attack blocked in this way consumes stamina, and it doesn’t have the same potential to turn the tables that parry, absorb, and evade do. This system creates an elegant flow to combat, with a back-and-forth between fighters as each they attempt to read each other’s moves and retaliate in kind. It’s relatively simple, in a mechanical sense, but there’s also plenty of depth and steep learning curve in adapting to the different fighting styles and attacks you encounter along your journey. Guarding against attacks is also how you extend your own arsenal. Each different attack in the game has its own experience bar of a sort, and each time you parry, absorb, evade, or guard a blow, you gain a little bit of experience; when a particular attack’s bar is full, you learn it. To put this into practice, you have to assign learnt moves to “combat decks”, which are essentially combos. You’ve got four stances, each with its own combat deck, and you can switch between them at will during a fight. Many attacks also automatically transition into another stance, so with the right moves and the right build, you can create long, flashy, chains that cycle seamlessly through your different decks. It can take some getting used to, especially because the tutorials in the game aren’t particularly helpful, but the system isn’t as complex as it first looks. 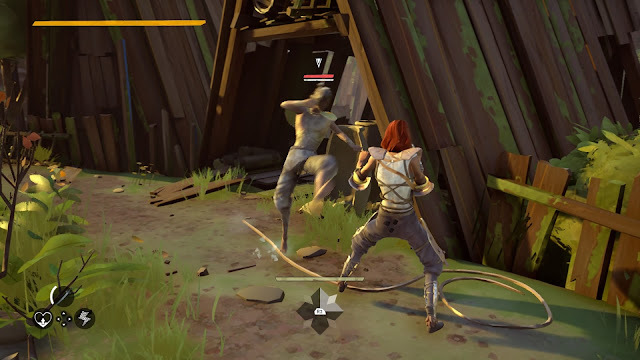 The problem that arises is that this is a great system for one-on-one fights, but Absolver rarely gives you the opportunity to engage in such. Most of the time, you find yourself fighting groups of two or three enemies at once without any real tools to deal with that. The class-based defensive moves are good only for repelling single strikes, so when two assailants attack you at once – as they often do – you’re left to simply eat the attack or rely on a weak, stamina-draining regular guard. The lock-on system makes it tricky to keep track of multiple enemies, especially if they manage to surround you. In single combat, Absolver has a fluid, elegant, deep fighting system; in multi-person fights, its haphazard and unwieldy. Unfortunately, the bulk of the game puts a focus on the latter. Allies can help in dealing with group threats, and this is another area where Absolver employs some bold ideas. If you choose to play online (which is the default), there’s an MMO-like element to the game where you can run into other players. You can communicate through a limited suite of gestures, ask for cooperation, or attack other players on a whim. When you encounter another player, you never really know what’s going to happen – they might help you, they might ignore you, they might attack you, they might pretend to be friendly and then turn on you when it suits them. It’s a fascinating system that makes every encounter with another player memorable and intense, and even as someone who doesn’t generally like multiplayer games – especially competitive ones – I found that tension exciting. It perfectly fits with Absolver’s general theme of a monk’s journey to martial prowess, through both cooperation and self-sufficiency. Your attacks can (and will) hit allies even if you don’t mean them to, so if you’re playing cooperatively, you always have to be mindful of where the other players are and the range of your attacks. Carelessness can turn quickly turn a profitable cooperative venture into a hostile one, which I’ve seen happen on a few occasions. Conversely, you also get a lot of comical, heartwarming moments where a player will accidentally hit another and then effusively emote to show their apology, be it out of genuine regret or to avoid a confrontation. It’s in these voiceless communications that Absolver shines. Unfortunately, server troubles make online play an ordeal, even though that’s where Absolver is at its best. Your mileage will obviously vary depending on your own circumstances, but myself (and a lot of other players, it seems) found latency to be a big problem. It makes a game as timing-dependent as this almost unplayable. It’s not just when other players are nearby, either; if you’re playing online, you can expect some lag, regardless. 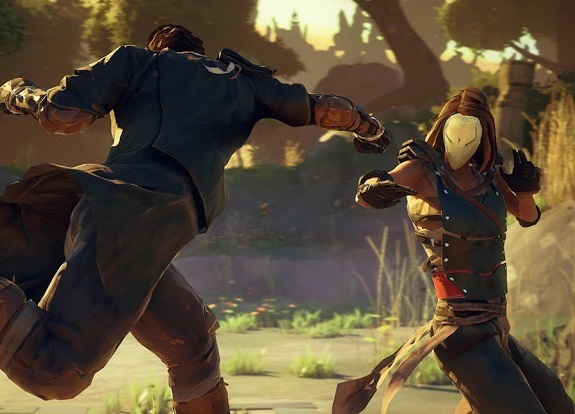 The obvious solution is to just play offline – which is a setting in the menu, not a separate mode – but in doing so, you lose so much of what Absolver has to offer. I had also had one strange (and, frankly, hilarious) situation where the presence of another player seemingly caused a duplicate of a nearby boss to spawn. I don't know if this is by design or what, but either way, we had two copies of the boss, duplicates of each of her two friends, myself, and this other player – a total of eight people, all trying to fight one another within a small room. I doubt this is a common occurrence, or even if the double bosses thing is a design feature or a bug, but it was a comedy of errors that highlighted a lot of Absolver's problems in one fell swoop. Combat is the core of Absolver, but it also gives you a beautiful, mysterious world to explore. The ancient ruins setting is perfect for this sort of game, with the creeping vegetation and destitute leftovers of a once-great empire creating an atmosphere that’s both serene and foreboding. Different offer a glimpse into different aspects of what the Adal Empire would have been like, from the docks that seem to carry the ghosts of a bustling marketplace, to the cold, watchful eyes of giant temples, to the network of treetop abodes and hanging walkways. The map is neither huge nor overly complex, but it’s rife with things to see and insights into the game world’s mysteries. That alone is reason to see what Absolver has to offer, even before you get to the intricate combat and excitement of interactions with other players. If the network was more stable and the game played more to its strengths around one-on-one combat, this would be a game I’d recommend in a heartbeat. It’s still well worth a look even with those flaws, but I can’t help but imagine what could have been.